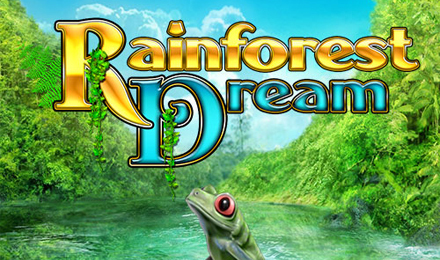 Enjoy the misty calm of the jungle when you play Rainforest Dream slots! Hunt for the legendary treasure and your wins will be more than just a dream! Search for the notorious treasure hidden away deep in the jungle when you bravely embark upon playing Rainforest Dream. Wade through this lush forest and meet black panthers, exotic birds, monkeys, and snakes along your path. Attempt to land the special Princess and Monsoon bonus features to activated more reels and random wilds for more chances to win! Use the flower bonus symbol to activate Free Spins and you could win 2,000x your wager!